Nikos has extensive professional working in the IT department of Athens International Airport as a senior project manager. He is an expert in airport IT solutions, and a consultant and implementer of many large-scale information management projects both local and international (India, Eastern Europe and other deployments). He also has considerable experience in airport and airline operations and business requirements both from an operational and a commercial standpoint. He has acquired major international experience in designing, implementing, auditing and commissioning airport-related mission-critical systems at major international airports, leading and participating in several EU funded projects (e.g. FP7, H2020) on behalf of the Airport, in the field of Airport Data Analytics, IoT, IT security etc. 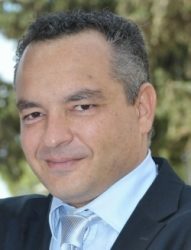 Nikolaos is a PMP, CISA, CRISC, CISSP, ITIL Certified, MSc and MBA holder.